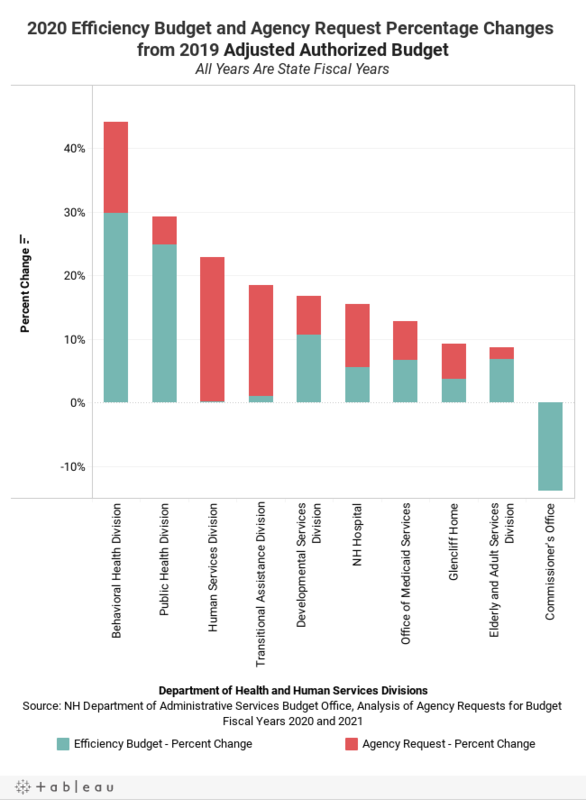 The New Hampshire Department of Health and Human Services is the largest State agency, with responsibility for major program areas including child protection at the Division of Children, Youth, and Families; Medicaid, which helps 180,000 people access health care, including children and those with disabilities; the Food Stamp Program, which provides food assistance to 78,000 Granite Staters; substance use disorder treatment and services; and mental health services. The Department’s budget request provides insights into the priority areas agency management sees as critical for funding in the next State Budget. The graphic below shows the differences between the Department’s funding requests, including both the efficiency budget and total request, for major divisions and offices within the Department for State Fiscal Year 2020 and the authorized adjusted budget in State Fiscal Year 2019. The percentage changes in these requests from State Fiscal Year 2019 shows how the Department’s total request is distributed across the Department’s operations in relative terms. The Department’s efficiency budget request for the two-year State Budget is an approximately 11 percent increase over the prior biennium’s budget as passed, and the total request is 20 percent. 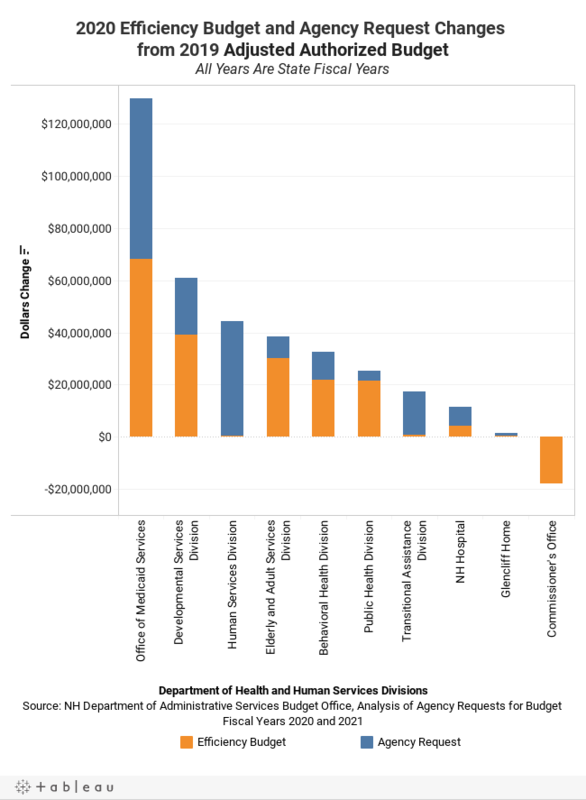 The efficiency budget requests show a significant increase the funding for the Divisions of Behavioral Health and Public Health, as organized in the State Budget’s appropriations, while the relative increases in the Human Services and Transitional Assistance Divisions are dominated by the additional prioritized needs portion of the request.